CNC Hydraulic Press Brake and Plate Hydraulic shearing machine are common machine for sheet metal fabrication. With long term developing, JINQIU already marked self characters on machine design and production. We have complete products line, Developed machine design, improved machine processing, thoughtful customer service. JINQIU was established in 1969 as national enterprise, changed into private company in 1990’s. From 1979, we started to produce hydraulic press brake and shearing machine. 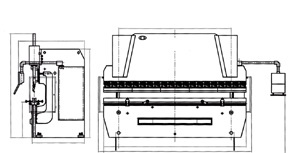 We were one of earliest manufacture in china, key sheet metal sheet equipments supplier. JINQIU brand is famous brand in china. We started machine exporting from 1990’s. “SERVICE is also part of our product.” We knew and take it as our duty before sales. So our service phone is 24hrs on line. We will reply customers complain and requirements in 24hrs. All machine trouble shooting shall be given in 2 days. Within warranty, parts shall be delivered by courier in 3 days. Technical guide file shall be emailed at same time. Now we have finished machines design more than 170, various capacity and style. CNC/NC/ Conventional Hydraulic Press Brakes capacity can be from 30T-3000T, length can be 1.3m – 18m (tandem). Hydraulic shearing machine can be 4mm~32mm thickness, length can be max up to 8m per single machine. With long term developing, JINQIU already developed and absorbed latest technology of sheet metal bending machine and hydraulic guillotines. Tandem Hydraulic Press Brake Light Pole Tooling Road construction and related equipments are infrastructure. many companies want to get into this industry. while some customers has experience on pole production, but some has no ..
How to make Light Pole? Light Pole production line Light Pole: We are talking about poles along the street/ road for lighting. It is different from poles for art garden poles or high mast for public square. With city expansion and .. Advantage of CNC Hydraulic Press Brake First, We equipped our CNC Hydraulic Press Brake with DELEM CNC system made in Holland and other key parts such as linear scale, hydraulic valve, servo motor are all importing prod .. Difference of NC /CNC Press Brake Normally Hydraulic press brake two cylinders synchronization method includes ELECTRIC-HYDRAULIC synchro and MECHANIC synchro. In General we call electric-hydraulic synchro press br ..